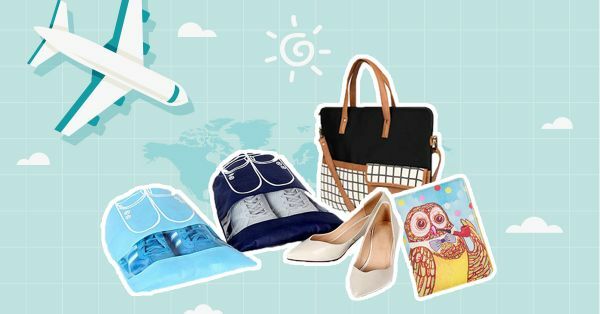 10 Funky Must-Have Travel Accessories For Your Next Trip! ‘You are what you eat,’ goes the saying. As a traveller, you’re also definitely what you wear and what you carry! Whether it’s backpacking across Europe, or exploring the forests of Amazon, these quirky travel accessories will make you stand out in the crowd. Take your pick from these funky patterns and bold prints specially designed for the wanderer and the soul-searching explorer in you. A curated and customised package, this gift box comes in three sizes (Safari, Voyage and Expedition) that takes care of all your travel essentials, from baggage tags and document holders, to even coasters and postcards! If you’re a true globetrotter at heart and are looking for the perfect way to document your adventures around the world, look no further. With a classy, matte black finish, the countries and capitals of the map reveal bright and beautiful colours underneath, when you scratch off the copper foil from the surface. How neat is that? Handy, compact, and super adorable, this holder comes with a pocket for your passport, your cash, and five others to hold your cards. Now, isn’t that a hoot! This floral backpack can be the travel amigo for your 9-5 routine or even the perfect companion for an excursion on the weekend. With mini pockets for all your valuables and knick-knacks, it can be paired with all of your favourite outfits, prepping you for all kinds of good vibes! Classy, minimal, and effortlessly chic, this sleeve is the personification of #TravelGoals! The spacious compartments for stationery and the long shoulder strap denote efficiency and style, whether it be an important business trip, or a long vacation at an exotic island. Everyone loves a good bucket-list journal. But this one comes with a whole set of stationery (including masking tapes and bookmarks), and prompts on every page to guide you through your list. Giving you the much needed inspiration for your travels, this is perfection, indeed. Move over, travel-sized neck pillows. The Head Pillow is here to stay, with options to use it as a collar, a hat, or even a blindfold. The perfect travel essential that helps you doze off anywhere, at anytime, for much needed commuting rest? Yes, please! With zipper pockets and spacious compartments for all your utilities, this Viaggi organiser is the holy grail for travellers who love carrying their toiletries in one simple and clutter-free storage space. You know you want it. “Give a girl the right shoes and she can conquer the world,” said Marilyn Monroe. Which is why, this set of nylon fabric, zipper closure bags is a necessity to safely pack your footwear, and keep them in great condition, cleanly tucked away from your clothes. Who run the world? Yep, we do. You know you’ve encompassed all kinds of goals when you find a travel mug, cleverly masquerading as a perfect telephoto lens, for your beverage. The lens lid keeps the temperature of your hot/cold drink intact, and the inner steel body prevents stains and smells from lingering in your mug. Are you impressed yet? So, how many of these have made their way into your shopping cart?